I have received numerous emails on this subject from both newbies and veterans so I thought it might be a good idea to write a post on what happened to the showroom traffic. Only a few short years ago you could go to any auto dealer in the country see people on dealership lots looking at cars, test driving cars and even more in the showroom negotiating deals, but today things are little different. Practically everywhere in the country there has been a decrease in car dealer showroom traffic. The car industry has had its share of ups and downs (mostly downs) in the last few years for seen several reasons ranging from the economy, a credit crash and even inventory availability. However there is more to it than that and recent statistics tell us the reason for decreased showroom traffic and that reason is the Internet. While we have been trying to make the best of an ugly state of affairs the world has changed and it is having a great impact on the car business. People are still buying cars, but they are doing things little differently today than they did only a few short years ago. The Internet and technology is continuing to move forward at a very fast pace and the business of selling cars is changing too. Granted our sales are down and our showroom traffic is down, but automobiles are still being sold every day. The numbers don’t lie and we can we see it in or showroom traffic. Ten years ago it was said that the average car buyer visited 3 or 4 car dealerships before they made a purchase and 2 years ago that number went down to 1.8 visits. 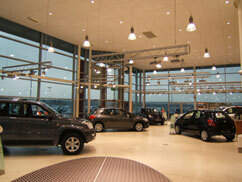 However several sources are saying that the number of physical dealership visits has gone down to 1.2 visits. That number is a little hard for me to swallow, but it sure it is lower than it was two years ago. People are visiting your showroom and in fact that number is rising, but they are not doing it in person. They are virtual visitors or virtual showroom traffic and they are doing from the comfort of their home or office from their computer or Smart Phone. They are visiting numerous automobile manufacturer websites, review sites, FaceBook and your websites. Instead of coming to your lot and getting excited about having a new vehicle they are surfing the web. They can see pictures, watch videos, read reviews and do research before they ever set foot on your lot. The Internet has placed an incredible amount of information in the hands of the consumer and we have less control over the first steps of the car buying process. They are creating their own desire, needs and wants with the tools available to them via the Internet and when the time comes to make a trip to their local dealership they are ready to purchase a vehicle. We have seen it from the showroom traffic we see today, they have printouts and know more about their vehicle of choice than most car salesman that are working the floor. I am not trying insult anyone out there, but it is true because they have spent so much time online researching the vehicle they want. Not that they can’t be switched after a walk-around and test drive, but they are usually pretty clear on what they want to buy. People are still buying cars and we need to make a living so now more than ever we need to step up our game. We are not out or disappearing, we are going to change and become a true car sales professional. The economy is getting better, inventory is available, credit is readily available, new models have more “Must Have” features than ever before and the tried and true rules of selling cars for a living remain unchanged. Decreased showroom traffic is merely a game changer and one that we will not take lightly. Product Knowledge: You can never have too much knowledge of your product. When the car buyer thinks they know what they want and you provide the knowledge and experience that goes beyond what they can find on the web they will want you to sell them a car. Frame of Reference: Remember that when they come to your dealership they are ready to buy not just kick the tires no matter what they may say. Treat them like buyers and not like lookers. Treat them like they own the place. Acknowledge the research they have done and compliment them, but also give them respect. Attitude: Enthusiasm and a Positive Attitude is contagious. They have chosen your dealership to visit and they are your potential customers. They want to buy a car or they wouldn't be there. Nobody comes to spend hours with a car salesman if they don’t want to buy a car. Get them involved and let their emotions help them make a decision to buy from you. Sell them you, the car and the dealership. Referrals, Past Customers and Reputation: Everybody wants a friend in the car business and you need to be that friend. A referral and a past customer is the easiest to sell. Get yourself out there, network, ask for referrals, use your dealership Bird Dog program and follow up with everyone that you sold a car to in the past. Today email is acceptable for follow-up and it is much easier and cheaper. A regular email on holidays, birthdays, and whenever there is a sale or service special will go a long way to retain your customers. If you are new to the business or a dealership ask your sales manger about orphan customers that you could contact. If they bought from your dealership in the past they are easy to sell to again. The car salesman of the future is not going away, they just need to become more professional. Showroom traffic is great, but if more of them are buyers instead of lookers and shoppers them it doesn't matter because you can still sell cars and make good car salesman income. In future posts I will include things that the floor car sales person and the Internet Sales Manager can do to create more traffic for them and the dealership. 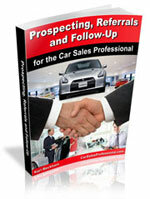 The future is bright if you can make the changes that are needed to prosper as a Car Sales Professional. When Fresh Ups Just Don't Cut It!